Correct Answer Jang Urdu Mini Puzzle Number 164. 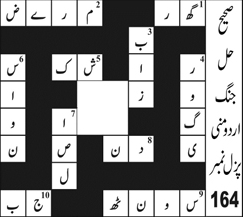 Jang Urdu Mini Puzzle Number 164 First Prize Rs. 90,000/- Cash. Jang Urdu Mini Puzzle Number 153 First Prize Rs. 60,000/-. Copyright The Daily The Jang Newspaper Pakistan. Jang Urdu Puzzle Number 169 Prize Distribution. Copyright The Daily The Jang Newspaper Pakistan. Jang Urdu Puzzle Number 169 Correct Solution. Copyright The Daily The Jang Newspaper Pakistan. Jang Urdu Puzzle Number 169 Prize Rs. 115,000. Copyright The Daily The Jang Newspaper Pakistan. Jang Urdu Mini Puzzle Number 152. Copyright The Daily The Jang Newspaper Pakistan. 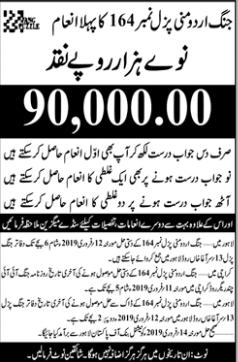 Jang Urdu Puzzle Number 168 First Prize 115,000 Details. Copyright The Daily The Jang Newspaper Pakistan. Jang Urdu Mini Puzzle Number 151 Correct Solution. Copyright The Daily The News Newspaper Pakistan. Jang Urdu Puzzle Number 167 Correct Solution. Copyright The Daily The Jang Newspaper Pakistan. Jang Urdu Puzzle Number 167 First Prize 115,000. Copyright The Daily The Jang Newspaper Pakistan. Jang Urdu Puzzle Number 166 Final Prize Details. Copyright The Daily The Jang Newspaper Pakistan. Jang Urdu Mini Puzzle Number 150 First Prize Rs. 60,000. Copyright The Daily The Jang Newspaper Pakistan. Jang Puzzle Number 166 Correct Solution. Copyright The Daily The Jang Newspaper Pakistan. Jang Urdu Puzzle Number 166 First Prize 115,000. Copyright The Daily The Jang Newspaper Pakistan. Jang Urdu Mini Puzzle Number 149 Prizes Results. Copyright The Daily The Jang Newspaper Pakistan. Jang Urdu Mini Puzzle Number 149 First Prize Rs. 60,000. Copyright The Daily The Jang Newspaper Pakistan. Jang Urdu Puzzle 165 Correct Solution. Copyright The Daily The Jang Newspaper Pakistan.